Chairman and CEO, Business Oxygen Pvt. 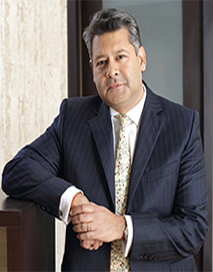 Ltd.
Mr. Pandey has been a banker for over two decades, having worked with Merrill Lynch and Riggs Bank in London. He was CEO of Ace Development Bank, Nepal, for over eight years. Presently, he is the Chairman and CEO of Business Oxygen Pvt. Ltd, a SME Venture Private Equity impact fund promoted by the IFC of the World Bank Group, DFID and the Strategic Climate Fund (PPCR). He is also the Chairman and Partner of White Lotus Centre, a development advisory firm that works with the private sector. His other involvements with the Government of Nepal include, being a member of the board of directors of the Investment Promotion Board at the Ministry of Industry and board member of the Investment Committee, Central Renewal Energy Fund, Ministry of Environment and Science. He is also a mentor and advisor at Microsoft Innovation Centre (MIC) Nepal. He has a BA in Business Administration and History from Virginia Tech University (USA) and MSc. in Development Economics from University of Bristol (UK).